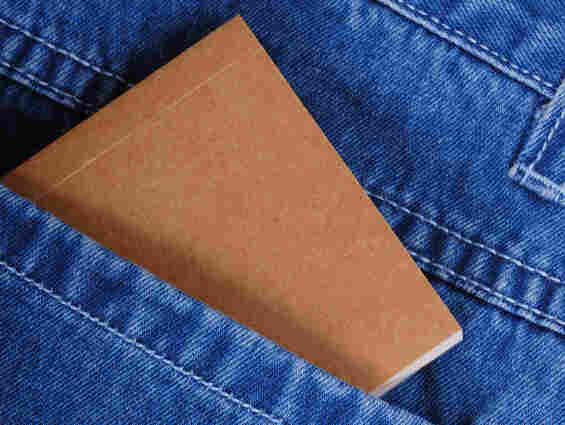 Get Ready To Celebrate Poem In Your Pocket Day National Poetry Month is wrapping up and the last hurrah for many poetry fans will be Thursday, which is Poem In Your Pocket day. The idea is to celebrate poetry by tucking a favorite poem into your back pocket to share with family, friends and co-workers. National Poetry Month may be coming to an end, but poetry lovers still have one big day to look forward to this April. This Thursday is Poem in Your Pocket Day. The idea is to tuck a favorite poem into your back pocket to share with family, friends and co-workers. Poetry lovers across the country have come up with clever ways to celebrate. At Baggby's Gourmet Sandwiches in Charlottesville, Virginia, customers will find something different in their bag lunches. Owner Jon LaPanta explains. "Usually they get a chocolate chip cookie with their sandwich," says LaPanta. "But on Thursday they'll get a poem. And usually they don't know about it, and they're like, 'What the heck is this?' They open it up, and it's always the same expression. They read, they look at it again, and then they'll smile and look back at us and thank us." Teachers like Brenda Krupp in Pennsylvania will use Poem In Your Pocket Day to entice students into the world of verse. "Third graders do not have pockets that are easily accessible," Krupp says. "So they actually sewed simple pockets that they will then wear on their t-shirts. And they're just going to be stuffed with poems they've written themselves, as well as some shorter poems that they just love." Dustin Johnson, a freshman English teacher at Choctaw High School in Oklahoma, asked each of his 90 students to bring a poem to class on Thursday, one that has special meaning to them. "We're going to go to our school's courtyard and use sidewalk chalk to write those poems on the concrete areas so that students from all over campus can come around and take a look at them." Look here for ideas on how to celebrate Poem In Your Pocket Day.